Bicycle shops should be doing great in this era of energy conservation but the cold equations of business economics are, for many bike shops, all two wheel. 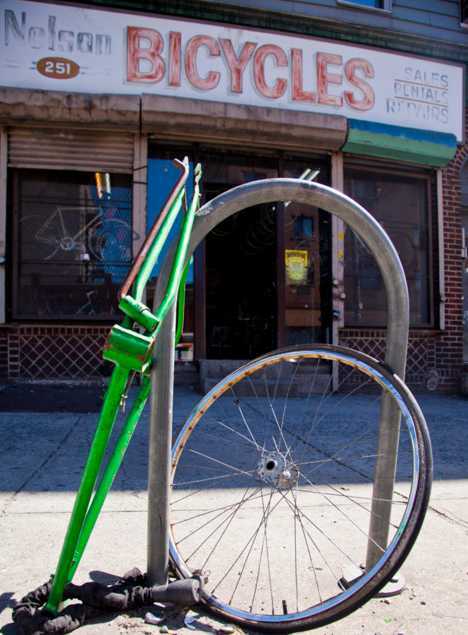 Nelson’s Bicycle Shop at 251 Bushwick Ave in Brooklyn, NY was a neighborhood icon for over thirty years. Nelson, the eponymous owner, was a store fixture as was his huge-headed cat who sadly passed away in 2001. Perhaps the loss of his kitty-cat companion was the last straw for Nelson, as he closed his shop sometime in 2012. A tip of the bike helmet to Diego of notsodigital for the vaguely disturbing image above. After 35-odd years at the corner of North Harvard and Bayard in Allston, MA, Bicycle Bill’s has shut the shop and gone digital.. or virtual. They’ve abandoned bricks & mortar and embraced the online retail revolution, is what we’re trying to say. 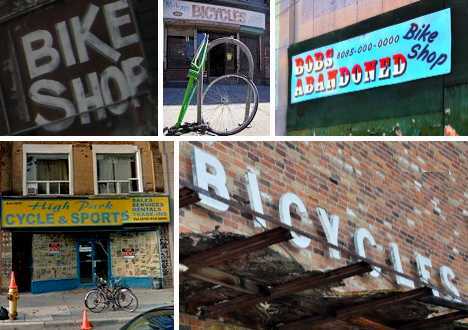 In any case, buying bikes online should prove challenging, not to mention servicing them. Then again, if dozens of highly critical reviews on Yelp are any indication, dealing with Bicycle Bill’s might be more satisfying if it’s not done in person. 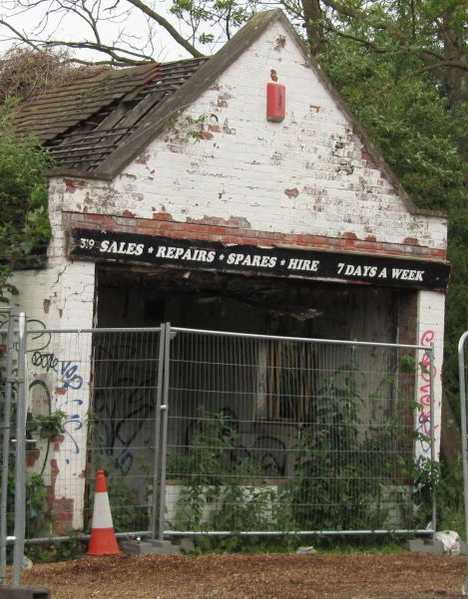 We could say this derelict bicycle sales, repair and rental shop is the poster child for abandoned retail stores and we would be right: the image above was chosen by OpenStreetMap Wiki to illustrate the keyword “abandoned”. The shop is located in Oxford, presumably England – where else would bikes be offered for “hire”? Portland, Oregon is a cycling mecca with a plethora of bike shops… make that a plethora minus one. 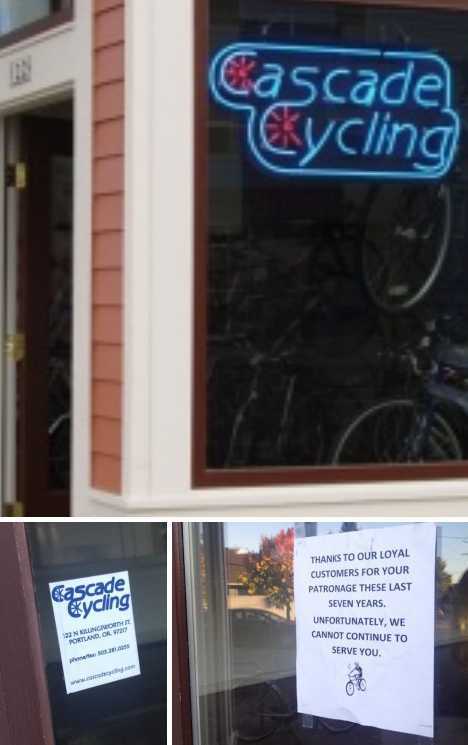 Cascade Cycling in north Portland found a comfortable market niche serving the city and surrounding area’s older market demographic after opening their doors in 2006 but a break-in in 2010 and the owner’s chronic health problems forced the shop to slam on the brakes in October of 2013.